Worldwide icon-chevron-right North America icon-chevron-right United States icon-chevron-right California icon-chevron-right Los Angeles icon-chevron-right I tried L.A.’s top-rated 420-friendly dating apps. Here’s what happened. 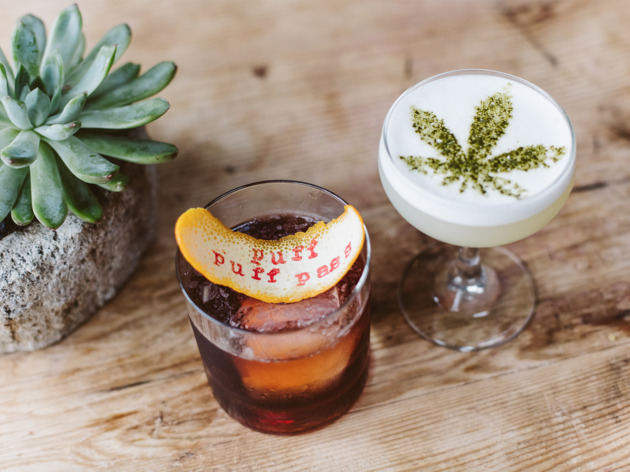 It should be no surprise that L.A.—home to Cheech & Chong, Snoop Dogg and an affinity for any trend that promises chill vibes—has fully embraced the relatively recent legalization of recreational weed. Outlets from Goop to the L.A. Times have expounded upon the ways the average Angeleno can use marijuana to achieve wellness, boost productivity and, yes, get faded; inhaling influencers have elevated pothead culture to an aesthetic that’s more Rihanna than Clueless’s Travis Birkenstock. Now, cannabis has reached the final frontier of millennial recreation: dating apps. Billed as “Tinder for tokers” and “the Cupids of cannabis,” a recent spate of dating apps have utilized marijuana's mainstream mania to offer singles in L.A.'s oft-disheartening dating scene a hassle-free path to a 420-friendly partner. As an L.A.-based single woman and casual cannabis user, I was intrigued: Even sans marijuana, Los Angeles can make the most straight-edge relationships seem stoned and surreal. The car culture bubble, class clashes and sprawling, disjointed neighborhoods mirror the dissociative isolation of an intense high; and the city’s sheer aesthetic weirdness is a trip in itself—see: acidic pollution sunsets, endless blocks of low-slung neon strip malls and cartoonish plastic surgery, punctuated by a wealth of modern and postmodern art and architecture. Considering my options in the app store, I fondly recalled an adolescence of lounging on the beach with Jack in the Box, a joint and a high school crush. I envisioned my future love life: taking in star shows at the Griffith Observatory and impassioned debates over the best taco truck on Glendale Boulevard. What more could any Angeleno want from a date? I had to give stoner dating a go. To start my marijuana matchmaking experiment, I downloaded three apps: 420 Singles, My 420 Mate and High There!. The interface of 420 Singles was the closest to Tinder, with left/right swiping and a message feature. You’re asked to upload a profile picture, as well as add an optional bio—though almost no one does. Most of the profiles were of young men holding blunts and advertisements for DJ nights at West Hollywood weed collectives; the highlight of 420 Singles (and, arguably, my entire experience) was stumbling across the profile of a C-list reality television star who had gone viral for his stint on a TLC dating show. High There’s interface seemed more buddy-oriented. Rather than casting potential partners aside with a dismissive swipe left, the app offers only positive action: send a message by saying “High There!”, move forward to someone new or move backwards in the deck if you fear you’ve missed a possible connection. The friendly vibe is strong enough that several male profiles stipulate “females only.” Out of all the apps, High There! also seemed to best demonstrate the Angeleno impulse to compulsively network: I came across the profiles of multiple actors looking for shoots and exchanged a few messages with a graphic designer who, within minutes, enthusiastically offered her services as an artistic collaborator. Across all apps, the singles’ profiles were in many ways similar to those you’d see on any dating app: laced with pot. There were exactly as many photos of Bob Marley as you’d expect (countless), as well as several profiles that were just photos of weed and may have been run by dispensaries rather than eligible humans. (I assume that a true cannabis connoisseur would swoon over the strain or stickiness of these images, but I found myself romantically nonplussed.) I swiped right on pot plants, hands holding blunts and a baby-faced pop singer-songwriter who claimed to be sponsored by a rolling paper company and implored profile visitors to DM him on Instagram instead. The true appeal of the apps came when I experimented with different dating parameters, switching between the age and location requirements I usually seek in a partner and a more expansive dating pool. This way, I found a fascinating cross-section of lonely L.A. stoners: students, car mechanics and industry execs, a senior citizen looking for someone to enjoy some weed in her camper trailer and an aspiring model/actor seeking a special someone to light up with before Dodgers games. There were hundreds of users, with diverse backgrounds and preferences. Surely, one of them would be able to fill me in on the most romantic spots to toke up or describe to me the specific appeal of stoners-only dating. Or… not. My experiment took an unexpected turn when, to put it, ahem, bluntly, absolutely no singles wanted to date me. Over the course of two weeks, I devoted daily time to swiping, liking and messaging across the three apps. I flirted into the void: “What’s your favorite restaurant when the munchies hit?” “What’s the best stoner movie about L.A.? I like Smiley Face ☺.” I received a grand total of two responses. The first, my potential artistic collaborator from High There!, stopped responding after three messages. I was convinced that 420 Singles’ messaging platform was glitching until I finally received a single reply, 11 days after my initial dispatch. The long-awaited message: “chill.” I couldn’t get anyone on My 420 Mate to match with me at all. And so, in answering one question (Q: What are stoner dating apps like? A: Dismal), I opened up a door to a different, bigger mystery. If I’d had success on mainstream dating apps—I’d once developed a healthy three-year relationship from an OKCupid date—why were these apps a total bust? I fully accept that some of this rejection comes down to the simple fact that people might not have wanted to match with me. And, of course, app dating is a numbers game: Data suggests that the High There and 420 Singles each boast over 100,000 downloads from Google Play, while My 420 Mate clocks in at around 5,000 downloads. Spread out over an international user base, that didn’t leave me with tons of singles to swipe. It’s also difficult to discount glitches or unintuitive interfaces—My 420 Mate logged me out every time I closed the app, for example, and was unable to send me its promised password reset email, so I lost some potential connections by having to re-create my account. Additionally, weed worship sometimes seemed to overtake the dating elements of the apps, making it difficult to discern whether users were seeking a connection or hyping up their vape pen brand. Interspersed between singles were a frustrating number of dispensary advertisements and profiles that seemed there for the wrong reasons (to pull a phrase from my other favorite pseudo-romantic pastime, The Bachelor franchise). I suspect that the main reason for this dearth of responses, however, has to do with the very demographic the apps are catering to. App dating is deceptively draining: managing multiple accounts, crafting creative messages and making the same energetic, best-self first impression banter ad nauseam is frankly exhausting. 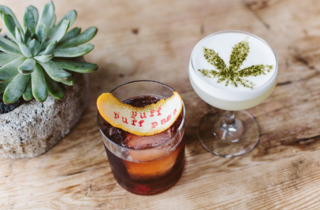 Diehard stoners—to whom these apps are ostensibly catering— aren’t exactly lauded for their ability to multi-task, exchange in rapid-fire conversation and set up and follow through on plans. It’s not a stretch to imagine that my advances were rejected less out of malice than an indica-induced lethargy, or a paranoia-fueled pressure to respond with the perfect witticism. Ultimately, devising a series of dating apps for potheads seems as savvy a business idea as a mattress review site for amphetamine enthusiasts. This isn’t to say, however, that my experience was a total loss. Mildly bruised ego notwithstanding, I developed a true affection for the singles of stoned L.A. The apps revealed a fascinating cross-section of Angelenos, demographically diverse and declaratively lonely, wanting to share their weed and their lives with one another (if not with me). Perhaps a wave of rejection is a strange basis for a love letter to Los Angeles, but swiping across that hazy digital landscape, I found a group of lonely-hearts unbound by age, race or location. Weed, it seems, is as great a unifier as exchanging Westside Rentals passwords, talking a stranger through a daunting parallel parking job and cavalierly contemplating the Big One. Personally, I’m going to redirect my single Angeleno energy back into furtively flirting with the baristas at Dinosaur, but I sincerely hope the smoking singles of Los Angeles find the love they’re looking for.